I haven't even gotten into edit mode yet. The best thing I have heard is the Tremolo. The Phase and the Rotary effect are really cool, too. I am anxious to get in and start messing with the fuzzes and OD's and playing with the delay/echo type effects. Bottom line is, everything sounds great so far. My head is kind of spinning. The Deluxe models, the Champ, the JTM 45, the freaking Badger 18!!!! The Badger sounds so damn good and I beside myself. It nails this tone from one of my favorite yt videos. Even the Dual Rec vintage is just awesome. The Friedmans sound like they could level houses if you turn them up. As decent as the Fender models are/were in the Mustang, they are just off the hook in the AX8. I am trying to keep one foot on the floor of reality. The amount of good tones is way over the line of overwhelming. I am trying hard to not sound like too much of a kook! Its funny that thanks to the AX8 i ordered a Badger 18, not the new one, the old one. I love the sound and breakup of the virtual amp that i finally found the deal i was hopping for the actual amp, $825. Should be in my hands next Monday. I thought long and hard about what I could buy with the same funds I used for the AX8. Not regrets so far. Model of the moment is the HiPower model, aka HiWatt DR103. Great Live at Leeds era The Who tones. It also covers lots of other classic British tones. And it likes my 335, which is a big deal for me. Now I just need to figure out if there is a Super Fuzz pedal model. I am getting by with the Fractal Tube Screamer and my external Treble Boost for now. I am still over the moon with the AX8. Yes, I have had some frustrating moments, but the biggest problem is being like a kid in a candy shop; I can't hardly decide which model to play next. Usually, I start scrolling towards a certain model and end up stopping on a different one before I get there. Then I play the one next to it, and the one next to that, and on and on it goes. I never have to think, I wish I could get X, Y, or Z tone. I even have Dumbles and Trainwrecks at my fingertips. They might not sound exactly like the real thing (how would I even know? ), but they sound so damn good, who cares? Even after my early frustrations with my 335, I have found quite few models on which it sounds great, even better than my other guitars on some models. So I have regained the joy of playing my 335. And the QSC K8, while it can still be hit and miss, I am mostly able to dial it in to sound good with almost every model. And, for sure, with some it just sounds flat out amazing. Last week I spent most of my time playing through the Rockerverb model (combos of Rat pedal, Maestro fuzz, and Treble Boost for OD) and the Super Reverb model (Big Muff PI, Maestro, Treble Boost). This week, so far, has been all tweed Princetone model. I had to make some time to revisit the vintage Dual Rectifier, and I even spent some time with the Friedman BE and HBE. And I am holding my tongue on the "what amp next threads?". I simply dial up every amp that anyone mentions and smile and play. I am still using a mix of my own classic pedals (fuzz and OD) and onboard Fractal FX. And to great effect, I must say. I landed on the Dizzy VH4 Blue 3 model last night. I thought it might have something to do with Van Halen? Turns out it is a Diezel VH4 model. Lots of gain, but a fairly classic tone. I rolled the guitar volume down to "2" and got some really usable classic tones and dialed the volume up for more crunch and leads, kicked in the Treble Boost (outboard) for really truly classic lead tones. F* Me! I never would have dreamed of using a Diezel (real or virtual) for anything. What a great model for absolutely killer low volume tone! Really good for practicing lead chops, too. A little Sunshine noodling on the neck p/u, volume 10 tone 5, with treble booster. I've been digging some Deizel myself lately... Good tones M! Once again, inspired by the "any new amps..." thread, I have been playing the Silver Jubilee model for the last 2 days. I had regular access to an original Silver Jubilee back when they were current. My buddy swore by his. It was too modern sounding for me at the time. But for jamming along at home, for fun, 25 years later, the AX8 Silver Jube model is awesome. I have been surprised by how much I have been enjoying it. FWIW - I am simply cataloging my thoughts (and occasional sound clips) here on the AX8, should anyone read this thread thinking about making a purchase. I am still 99 and 1/2 percent smitten with the AX8. More like 99 and 9/10ths really. I used to get pretty excited by the somewhat incredible tones I could get out of the little $99 Mustang I. The AX8 just takes that to another level, about x 100. I was very happy with the Fender tones and 60's British tones I could get from the Mustang, but since getting the AX8, I have been reborn with enthusiasm for classic Marshall tones like never before. And all the Fender tones are there, too. And models that take my fuzzes and treble booster, and on and on. Preach the truth my brother. My head still gets turned from time to time by 'real' amps. 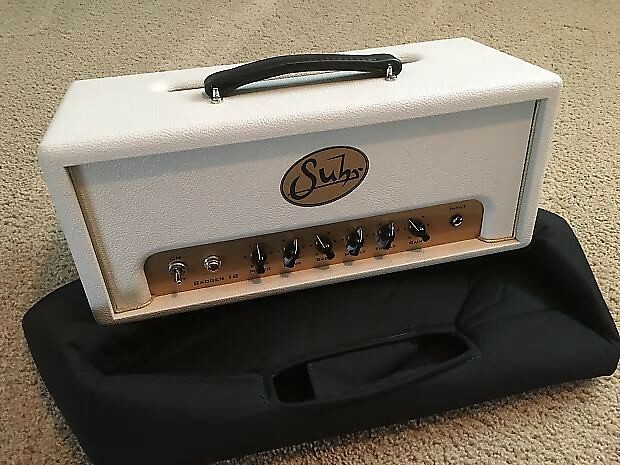 The new Supro 5 watt reverb amp looks great and would be perfect with my vintage style pedals, but....then I plug into the AX8 and there is just no reason. This week I played for several days on the Brownface model. I tweaked the reverb to be just a bit more splashy, dialed back some of the drive, dialed the low filter on the speaker to 120whatevers. Changed the drive pedal from TS to a Tone Bender with the drive pretty low and the volume just fudged above unity for some really great Led Zep I type tones. Played clean, it can do surf and Chuck Berry and vintage 60's R&B and pop, all day. I am thinking about putting my Maxon OD808 back in my signal chain. I don't need to, but I like my pedals. And for the last 2 days, I have been back on the Dual Rectifier vintage model which is just awesome. And before the Brownface I was stuck back on the Badger 18 for days (does everything and sounds great). Even the QSC K8 is sounding decent. Do they break in? Well my friend. I will remind you of a time when I too was bitten by the desire to have a Tube Amp again. You might remember that I commissioned Don at Soul Tramp to make me a super duper tweed clone. He put his best into it.. It sounded awesome.. But then so did my Tweed preset.. In fact, many Tweed presets.. The Soul Tramp was sold 2 weeks later. Monthly update. I have shrugged off a few more moments of buying another low powered amp, just for the fun of it. I tried to make some "heavy" clips of the Orange Rockerverb model for Caoimain, but I wasn't sure exactly what he wanted. I had fun screwing around though. The straight Rockerverb model is awesome. It sounds just like what a JCM800 era 2204 should sound like. Using the Fractal Tube Screamer to boost it gives classic hard rock lead tones. I also used my Maestro Fuzz and my Treble Booster (real outboard pedals) to achieve super saturated stoner doom tones; just wickedly cool sounding old school tones. No digital overtones, just straight up (emulated) tube tones, colored by silicon and germanium transistor bubbly goodness. Just like a "real" tube amp, the Rockerverb sounds most natural in its straight amp setting. Adding the TS or the Fuzz or the Boost (or all of them at once ) makes things sound progressively more solid state. The cool thing, though, is you can really hear the tone of the fuzz itself coming through. It is so cool! Gurgle, gurgle, bubble, bubble. Sounds like LSD. More recently, I have been playing the Top Boost model. It has such a good vibe for real vintage tone (in my head, anyway). With the amp drive up a bit, it sounds like real tubes as you strum through a chord; all the warmth, depth, and top end sparkle (which with a meaty mid range, distinguishes the AC type model, I guess ). No matter, it sounds good and it sounds classic 60's vintage, not digital modeler 2017. I was trying to dial in an SVT Reverb 10 sound like the amp Doug and Pat use for their demos. I don't A/B tones, I just dial in what that should sound like in my head. Whatever I have dialed in sounds good. I am loving it with some subtle tremolo on all the time. Swampy, funky, old time good fun. Again, I am just documenting my experience, should anyone be considering an AX8. It may or may not give you exacting vintage amp tones (or modern high gain, or stoner/doom, or whatever), but the tones it gives will definitely be great. Not good, but foo*king great. Rock on. I'll be over here playing Chuck Berry and Hendrix and Black Sabbath and The Stooges and The Who and The Yardbirds and Cream. I'm glad this is working out for you so well. Try to find some Suhr Badger 18 presets. Even the one in the machine is awesome. I have been playing that preset clean this morning. Now let me ask this to you and others. Do you now see what I have been saying way back years ago when i would say tube amps are boring? Its not the tone they produce that makes me feel that way. Its the fact that one is stuck with basically that one tone. This is why I would change amps so frequently. I would be tired of that one basic sound and as I progressed in my playing skills and tastes I would want more from the amp. These days with Fractal I have absolutely no interest at all in buying another amp. Even for portable use. A 3U rack containing my AXE FX and a Matrix power amp combined with my XiTone 1 12 makes an easy grab and go.. Think of how much power that brings to a player.. 220 amps models and every studio quality effect available. What has made me so Fanboi-ish with all this is just how much it does bring a player its hard for me to fathom why in many circles this tech is shunned upon. Now let me ask this to you and others. Do you now see what I have been saying way back years ago when i would say tube amps are boring? Its not the tone they produce that makes me feet that way. Its the fact that one is stuck with basically that one tone. This is why I would change amps so frequently. I would be tired of that one basic sound and as I progressed in my playing skills and tastes I would want more from the amp. The Badger 18 preset blew me away on day one. I love it. There is a CME yt demo where Joel is playing the real thing with a 335 and it is one of my absolutely favorite yt videos of all time. The Badger 18 model isn't exactly like Joel's demo, but close enough (and I could never make a real Badger sound the way Joel does, anyway! ). I even cloned the Badger and saved it to an empty preset, changed it to a Badger 30 model and tweaked it to my liking as my first "created" preset (I still haven't built one from scratch). I can understand what you mean and why you might think a one trick tube amp, no matter how good sounding, is boring. I don't find my tube amps boring, but I have three at home, plus the Marshall Lead 20 SS amp, plus I have had the Mustang Modeler since 2012 or so. So I was never bored. But I played my Marshall JMP 2204 almost exclusively for 20 odd years. It was THEE tone for me for all those years. I would force myself to play the Champ in order to get a different perspective, but the 2204 was it for me. Now, not so much. I am very happy exploring other territory. The Mustang allowed that to a certain degree, and as you say, was the perfect travel option - could keep me entertained for weeks on end. And I put it to good use at home, too. My current situ is a little bit strange. I have been working away from home for 2 years, barely getting home to play my old stuff. The Mustang kept me happy and entertained until it broke. It also gave me low volume and headphones options my Champ or 2204 never could. The AX8 took the place of the Mustang, and it has never disappointed. The headphones tone (takes some extra kit with the AX8) is otherworldly, and the amplified tone takes it places the Mustang couldn't go. I am limited to low volume only in my current situation (except for the very rare occasion) and the AX8 is just awesome. I was playing the Top Boost clean, low volume this AM and getting tones and harmonics and response that simply would not be possible, at that volume, with the real thing. I can have the AX8 absolutely screaming with Jimi at Woodstock levels of sustain and feedback without anyone else being disturbed. So, some of my situation is unique to me. I would probably still enjoy playing the Champ and the 2204 at home, even with the AX8, but I won't really know until I eventually return home, long term. But no matter the need, Fractal amp models are excellent. And the reverbs and the delays and the tremolos and Phasers are just awesome. Part of my justification for the AX8 was wanting a good vibe or phaser (or both), and several more vintage fuzz and OD pedals. Well, the AX8 can be had for less than the outlay of all that and opens new doors with extraordinary amp models. Add in a bunch of stuff I might use occasionally if I had it, but wouldn't spend the $$$ to just use once in awhile..Kind of a no brainer.